Veteran USA goaltender Steve Cash makes a save during the third period at HarborCenter on Sunday. Ask Josh Sweeney what makes Steve Cash such an incredible goaltender and he tells you point blank, with a laugh, that he has no idea. 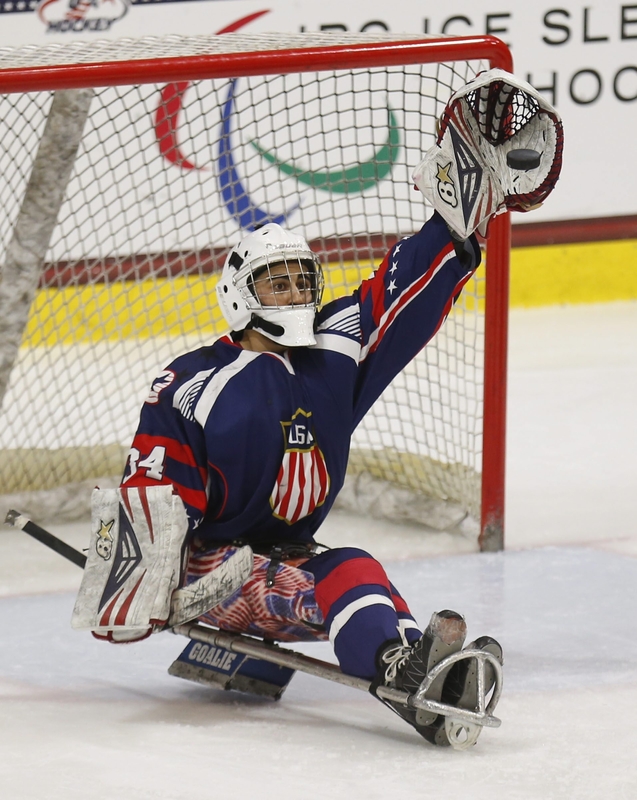 The big win was a 6-1 decision over Russia for the United States in its opening game of the 2015 IPC Sledge Hockey World Championships at HarborCenter on Sunday night. That fast, positional play by Cash was evident several times throughout the game. Take one save in the second period. The Americans had a 3-1 lead and Russia had turned aggressive and quick with the puck in the offensive zone. Cash watched the play developing on his left but quickly glanced to see a Russian forward hanging out all alone to his right. As the perfect pass slid across the slot, Cash deftly moved ahead of the puck, denying the opportunity in dramatic fashion. Cash isn’t much for talking about the dramatics, but he will talk all night long about how well his teammates played. The U.S. had built a 3-0 lead before Cash let in his only goal of the night – a blast from Ilia Volkov with 2:06 left in the second. He finished with 12 saves while his teammates netted six goals on 13 shots. While the goals gave Cash a cushion, he was calm and confident in net. A veteran of the U.S. national sled hockey team since the 2005-06 season, he has a perspective that helped the Americans kick it down a notch when the emotions of playing at home in front of 1,411 USA fans were a bit too amped up at the start. He gives them confidence and bails them out, but in return he gets a little bit of chirping. For example, the goalie mask he wore in the Sochi Paralympics was cracked a month ago. Without time to get a new mask painted for this tournament, he’s going with the all-white look. “I was forced to play with a new mask and go with eggshell white, basically,” Cash said. “That’s what I call it. Eggshell on my head. I plan on getting it painted for next season. I just wasn’t able to get it done in time. All the guys are hounding me to get it done. They were disappointed to see me show up with an eggshell.